The talk starts with a short introduction of Hasso Plattner Institute (HPI) and some selected innovation results created from HPI. After a review for the state-of-the-art of Artificial Intelligent (AI) and Big Data technologies, several machine learning (especially deep learning) approaches and their applications are presented in detail. Some currently running HPI research projects in this area will be introduced as well , e.g., automatic multimedia analysis, Image Captioning, neural style paintings, big data security analytics, etc., in the talk. 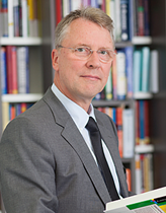 Prof. Dr. Christoph Meinel is President and Director of Hasso Plattner Institute (HPI) and Dean of Digital Engineering Faculty at University of Potsdam, Germany. He is a Professor (C4) of Computer Science at HPI and holds the Chair of Internet Technologies and Systems. He is a member of the National Academy of Science and Engineering (acatech), Director of the HPI-Stanford Design Thinking Research Program and a member of numerous scientific committees and Supervisory Boards. He became a Concurrent Professor at Nanjing University in 2016. His current research focuses on security engineering, knowledge engineering, multimedia analysis and deep learning. He is also scientifically active in Design Thinking research. His earlier scientific work concentrated on efficient algorithms and complexity theory. He is the author or coauthor of 25 books and anthologies, as well as numerous conference proceedings. He has published more than 700 (peer-reviewed) papers in scientific journals and at international conferences and holds a number of international patents.